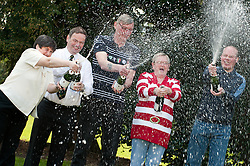 A Lincolnshire based Lottery Syndicate has won a whopping £4.1 Million Jackpot from the February 5th 2011 draw. 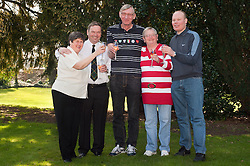 Sydicate member Andrew Mowat with his wife Christine and syndicate members John & Chris Bell and Joe Burton went public at a press conference in Sleaford on Monday (7th March). 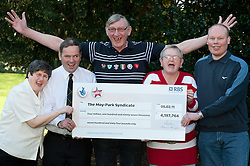 John and Chris play seven of the syndicates ten lines giving them a massive £2.9 Million pound Share while Andrew and Joe collected £419,776 each. A fifth Syndicate member chose to stay anonymous.